In the article, Google mentioned that you do not need to change anything if you have a responsive site or a dynamic serving site where the primary content and markup is equivalent across your mobile and desktop sites. Also, Google states, “If you only have a desktop site, we’ll continue to index your desktop site just fine, even if we’re using a mobile user agent to view your site.” With Google moving all-in on mobile, it is more important now to focus on your mobile strategy. One of the most important elements of mobile SEO is conducting keyword research and creating content for mobile users. Often, organizations fail at thinking of the mobile user when designing a page or drafting content. It is important to think through all the types of searches your audience will conduct on any type of device. Mobile search queries typically include more conversational-based queries that are related to voice searches. Also include content that users will want to consume on their mobile devices. When optimizing for mobile devices, make sure to take in account the lack of search engine result page (SERP) real estate. The amount of real estate on a mobile SERP is much smaller than desktop or tablet devices (as you can see below) so try to be concise within the title tags and other metadata. Besides optimizing the metadata and content, consider adding schema markup to the page to help show rich snippets on the mobile SERPs to gain more visibility. Another tactic to consider when optimizing for mobile devices is the pagespeed. Google has continued to put an emphasis on pagespeed especially for mobile devices over the last couple years. A slow loading mobile page provides a low-quality user experience, which can cost websites many valuable customers. 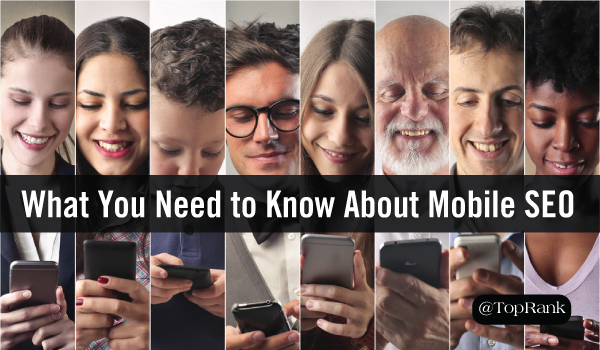 Another best practice for mobile SEO is to avoid intrusive pop ups or interstitials. Google stated in an article, “To improve the mobile search experience, after January 10, 2017, pages where content is not easily accessible to a user on the transition from the mobile search results may not rank as highly.” As frustrating as popups can be on mobile sites, there are research studies that show how effective they can be for gaining miro-conversions. If you choose to use popups on your mobile site make sure that it does not take up the majority of the content or is difficult to close by January 10, 2017. Below are examples of interstitials that make content less accessible that Google provided within the article. Another design aspect for mobile devices other than popups or interstitials is to make sure all elements are easy to click on. The layout should be thought through to avoid accidental clicks or any issue with scrolling through a page. There are three main techniques you can serve a mobile site to users. Those three ways include responsive design, dynamic serving, and separate URLs. Each technique can provide a solid user experience for different reasons. Google does a great job explaining the differences of each technique. Overall, it is important to make sure your mobile site is optimized and provides the best user experience possible. Make sure to update your mobile site, if possible, as Google continues to experiment the updated mobile first index. If you currently do not have a mobile site, then you might want to begin thinking about developing one. There isn’t a sudden rush to complete, but an optimize mobile site can help increase your ROI for your online marketing channels. Out of curiosity, how many of you read this post on a mobile device? If you have questions about your mobile site or SEO strategy, contact TopRank Marketing to get your mobile SEO audit. Read this story from my Microsoft 950L, I only use Bing. This must put me in quite the minority.